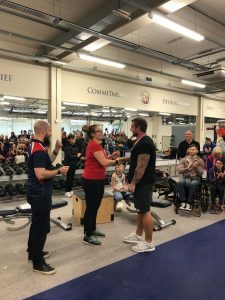 On 26th August the Swindon Barbell Team travelled to Tedworth House Sports Recovery Centre to support the Help for Heroes Charity Para-powerlifting Competition. Three of our members plus Head Coach Charlie pitched in to staff the event – organised by Ben Richens – which aimed to raise money for Help for Heroes. 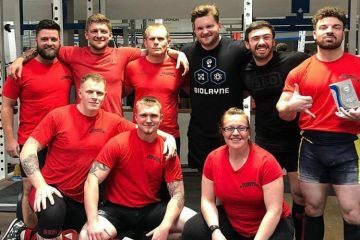 The event, coined the Bench Press Bonanza by organiser Ben, is part of a much larger series of Para-powerlifting competitions to raise money for veterans which will culminate in the Invictus Games (20th October in Sydney Australia) and the World Military Fire Police Championships (November 28th in Kings Lynn). During the competition members of Swindon Barbell took on various important roles. National Referee Helen Toms took on the challenge of refereeing the day, ensuring that all lifters received Start, Press and Rack commands that met their individual needs, from tap commands to visual prompts she ensured that all lifters were able to put the worry of missing a command out of their minds and focus on striving for that illusive personal best. To ensure the safety of all competitors, members Mark Townend, Emily Sheppard and Head Coach Charlie Shotton-Gale took to the platform to load weights and spot each and every lift, keeping a keen eye on the safety of every lifter. 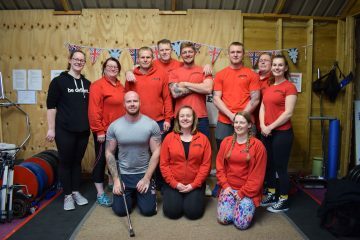 This is the second time that Swindon Barbell have taken lifters to support the platform for a Help for Heroes event, previously staffing the Invictus Games Trials in April. 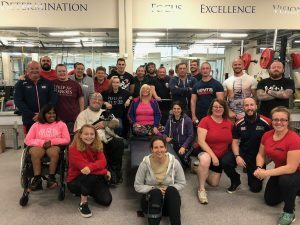 The team are often called upon to support both Classic and Para-powerlifting competitions due to the dedicated and hardworking culture that we grow in the club, and we are proud to be called upon for such a good cause and such inspiring events! 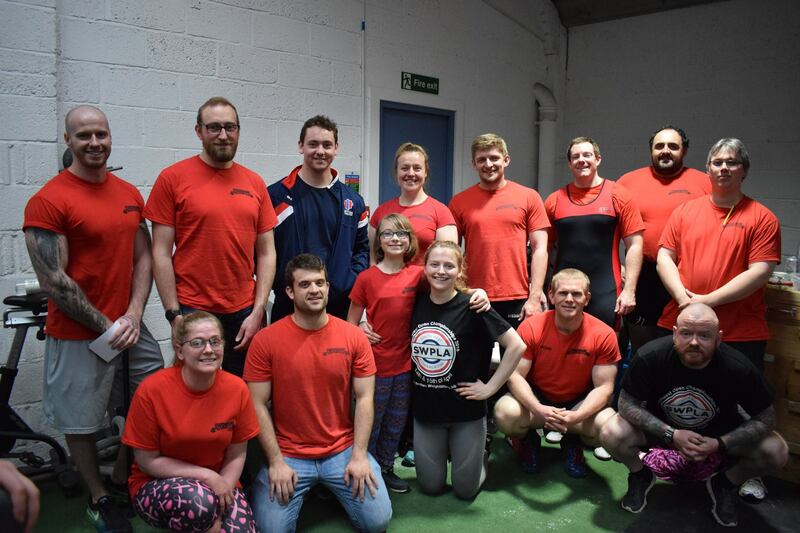 Swindon Barbell work to ensure that this culture continues to grow, working in partnership with agencies such as Swindon Sports Forum and the Wiltshire and Swindon Sports Partnership to provide facilities and strength coaching for those of all abilities. Over the years Head Coach Charlie has worked regularly with the Help for Heroes initiative, starting with a weekend coaching in 2017. Since then she has gone on to become Assistant Coach for the Invictus games and Lead Coach for the Invictus trials in April. All while continuing to grow and develop her own home club! In total the Bench Press Bonanza raised £580, which will go directly to Help for Heroes. On top of that many lifters achieved huge personal bests, bringing a little bit of extra joy to the occasion. Congratulations go to Vicky Parrett and Dan Best with the heaviest benches of the day of 79kg and 177kg respectively. 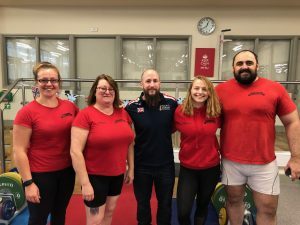 Competitions like this are just one small way that the Para-powerlifting team is able to say thank you to a charity that has helped so many of them find their way through life following injury or ailment in service to Queen and Country. Swindon Barbell are honoured to be a part of that.